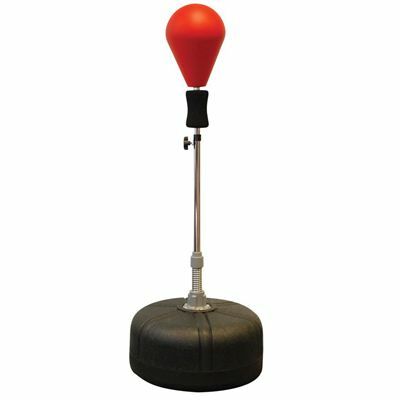 The Boxing Mad Junior Adjustable Freestanding Speed Ball features a durable PU punch ball on a sprung, chrome plated, bar and a base which can be filled with water or sand. Ideal for enthusiastic juniors starting out in the sport. Bought this for my grandson's 9th birthday. He has recently started boxing classes and he loves it. It's a good sturdy piece of equipment, once you put the sand in! Can't answer how it compares to similar products but several I looked at didn't look too sturdy so plumbed for this one and am glad I did. A little pricy compared to others but got a small discount and if my grandson is happy, I'm happy. for submitting product review about Boxing Mad Junior Adjustable Freestanding Speed Ball.